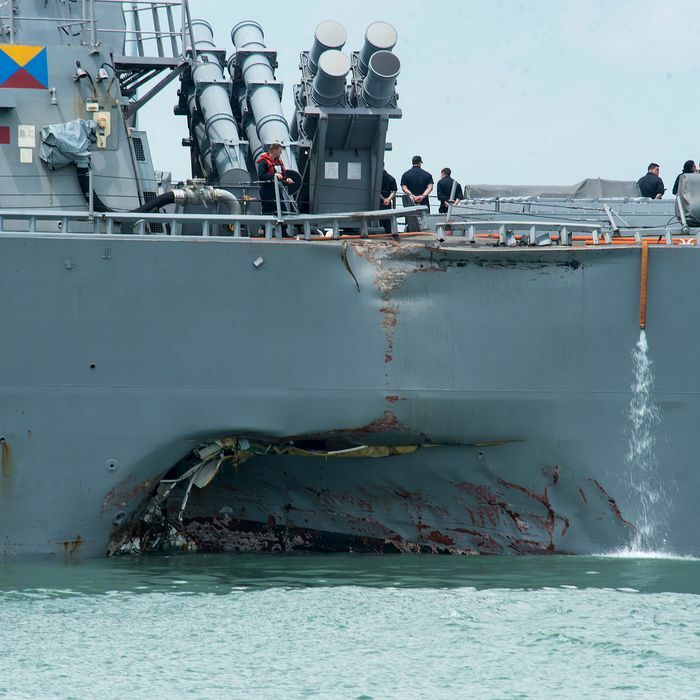 The U.S. Navy on Thursday ended the search-and-rescue mission for the nine sailors still missing after Monday’s collision between the U.S.S. John S. McCain and an oil tanker. Its efforts will now be focused on recovery, an acknowledgement that the sailors are not expected to be found alive. The McCain is now at Singapore’s Changi Naval Base, where its flooded compartments are being searched for further signs of the missing sailors. The search of the sea does not appear to have yielded any relevant remains. The Royal Malaysian Navy did find a body while searching the ocean Tuesday, but it was not one of the missing sailors. Thursday’s announcement comes as ships in the Seventh Fleet have been ordered to observe an operational stand-down, allowing commanders to assess safety procedures. Each ship in the fleet has been directed to dedicate a day to reviewing safety standards, updating protocols, and running emergency drills. “History has shown that continuous operations over time causes basic skills to atrophy and in some cases gives commands a false sense of their overall readiness,” Admiral Scott Swift said in a statement.